Both the impact crusher and the hammer crusher crush the material through high-speed impact, and the appearance of the two is very similar, so many people can’t tell the counter-attack and the hammer. Use this article to solve these problems. (1) The discharge particle size is uniform, the grain shape is good, and the content of fine powder and dust is very low. (2) Low operating costs and low investment costs. The weight and size of the impact crusher are smaller than that of the hammer crusher, which can effectively reduce the civil construction cost. Moreover, compared with the two devices of the same output, the motor power required for the counterattack is low, which can effectively reduce the power consumption of the device and reduce the operating cost. (3) The impactor of the impact crusher has a long service life, and the semi-automatic hydraulic open top device can help the inspection and maintenance of the equipment and the replacement of wearing parts more quickly and effortlessly. The impact crusher can effectively handle materials with large moisture content and prevent clogging of the crusher. When the moisture content of the treated material is too large, the feed chute and the counterplate of the impact crusher may be equipped with a heating device to prevent the material from sticking. The impact crusher does not need to be equipped with a bottom sieve plate to prevent clogging. The hammer crusher cannot be heated to prevent material sticking and must be equipped with a bottom screen to increase the possibility of blockage. When the non-crushed material (such as iron block) enters the crushing chamber, the front and rear counter-attacks retreat, and the non-crushed objects are discharged from the machine; when the crusher resumes work, the counter-attack frame automatically returns to its normal working position by means of the self-weight safety device, and then It avoids the risk of equipment overload and the loss caused by downtime maintenance. Since the entire process is automated, the manual maintenance and cleaning time is greatly reduced, which greatly improves the production efficiency of the entire production line. (3) The range of discharge adjustment is wider. The adjustment of the discharge size is easier. The top of the impact crusher is provided with a mechanical adjustment device, which can adjust the spacing of the counter frame and the rotor by screwing the bolt of the device, thereby adjusting the discharge size, and adjusting the speed of the rotor, adjusting the gap between the counter plate and the grinding chamber, etc. It can effectively and easily adjust the size of the discharge size. 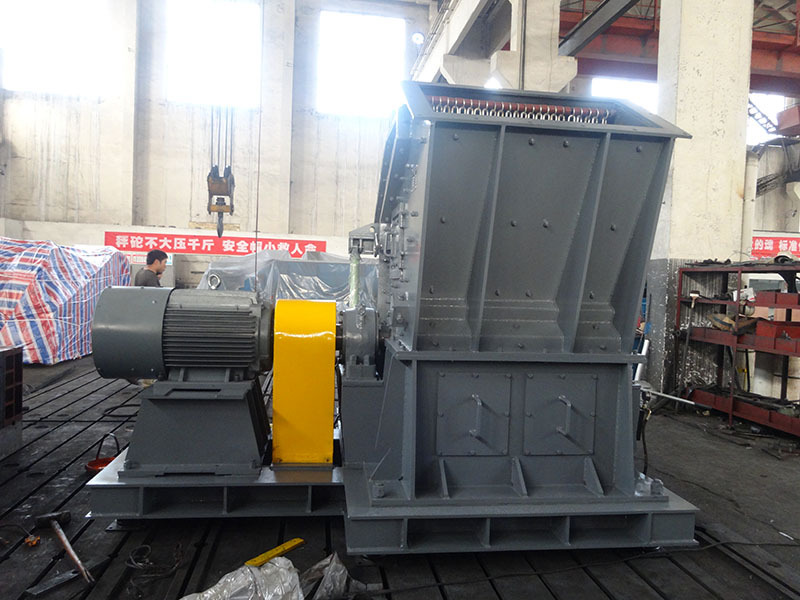 The hammer crusher can only adjust the discharge particle size by replacing the bottom sieve plate. The hammer of the impact crusher is cast from a high-chromium material and a wear-resistant material composite process, and has undergone strict heat treatment, and has good mechanical shock resistance and thermal shock resistance. Because the traditional linear hammer is easy to wear and wear, the impact surface of the hammer cannot collide perpendicularly with the material, and the crushing efficiency is rapidly decreased. The impact crusher adopts a crescent-shaped hammer. This design not only has a large impact force, but also has a larger impact surface. durable. The impact crusher adopts hydraulic adjustment system. According to the operation requirements, the counter-attack and the plate hammer spacing can be easily adjusted. The modular design of the wearing parts of the equipment is also equipped with a hydraulic opening device to facilitate the replacement of wearing parts. Operation, greatly reducing labor and time investment.